I'm BACK!! Well, only for a brief moment. Life is still as busy as a cat on a hot tin roof...but more on that in a moment. 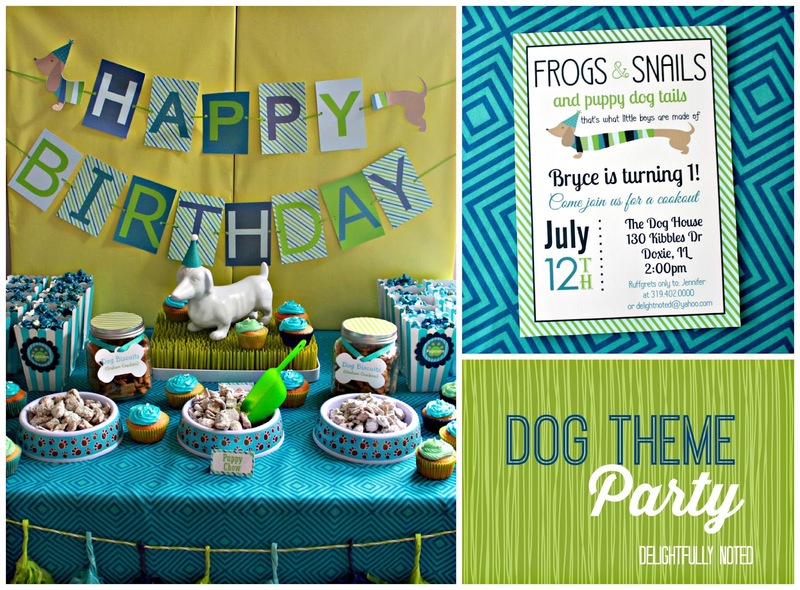 Today I'm dropping by to share with you all the birthday party we threw for Baby B a few weekends ago. Yes, can you believe he's already ONE?! Fastest year of my life! 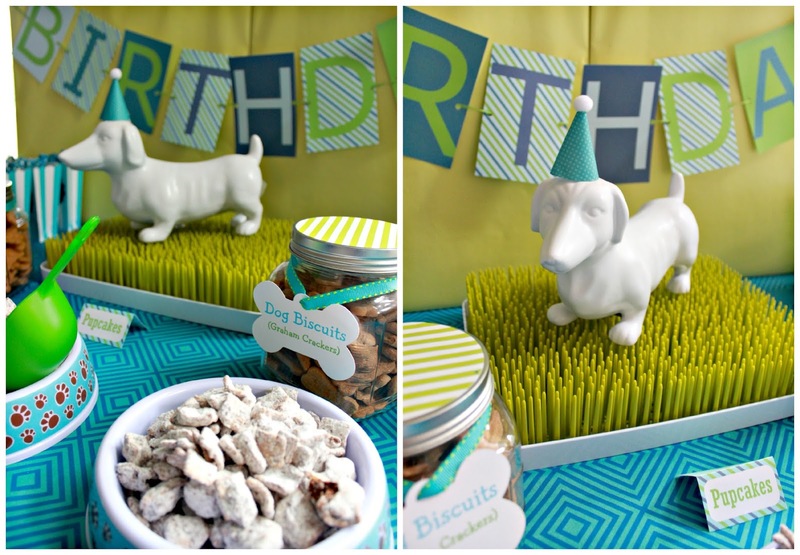 B loves terrorizing playing with our doxies so it only seem natural that we throw him a dog themed party, specifically a wiener dog one. I started planning this party months in advance, which was a good thing BOTH for me AND the lives of my loved ones. 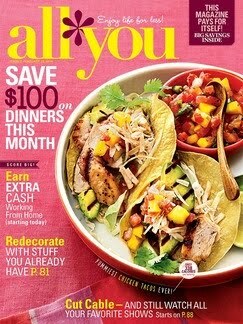 Not only am I a tad bit obsessed when it comes to party details (too bad I can't be this way with exercising!) but I also like to make and create as many things as I can myself. I totally worked my Silhouette Cameo like a dog (pun intended) for this party! 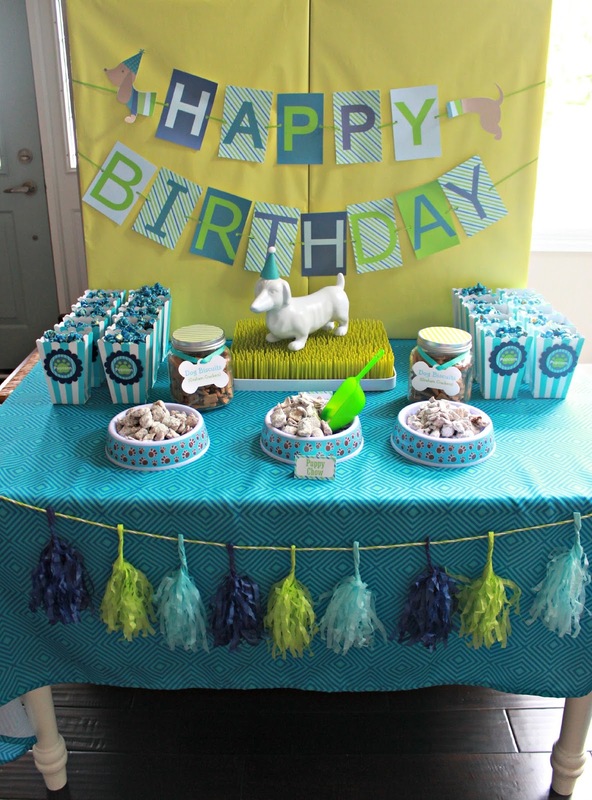 I had so much fun creating all of the paper goodies like the invites, birthday banner, food tents, and tags. We had the party at our home and rented out a tent for the day. The dessert table was one of my favorite things to work on. 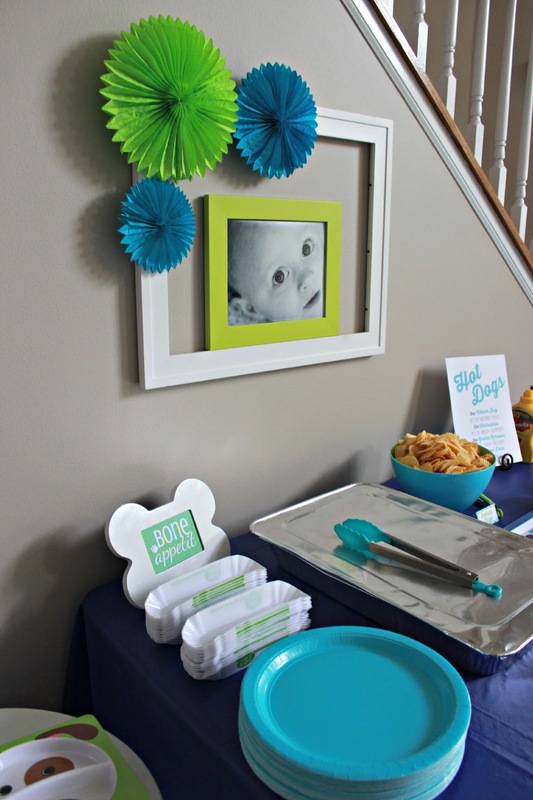 The tissue garland was found at Target and ended up being the inspiration for the party's color theme. Outside of that I managed to find a lot of other party goodies at the Dollar Store and Party City. A full source list will be made available at the end of my ramblings. (PS. Let's just clarify the above pic was taken before the "pupcakes" arrived in case you were wondering if I ate them all). All of the food was labeled with dog-themed names. 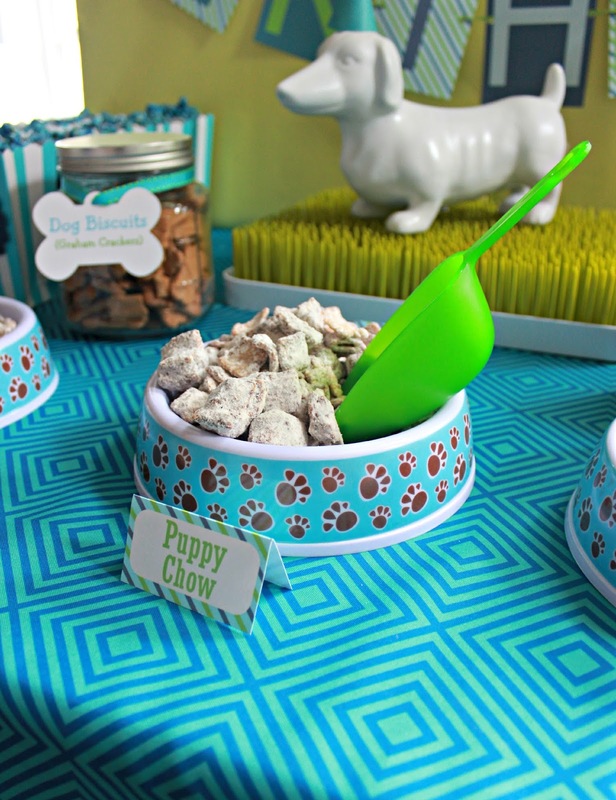 For the dessert table we had blueberry flavored "pupcorn", vanilla"pupcakes", puppy chow, and dog biscuits (Scooby snacks). One the main food table I set up a little hot dog bar along with some more themed food such as "dog house salad", "good boy baked beans", "pawtato salad", and "pawtato chips". 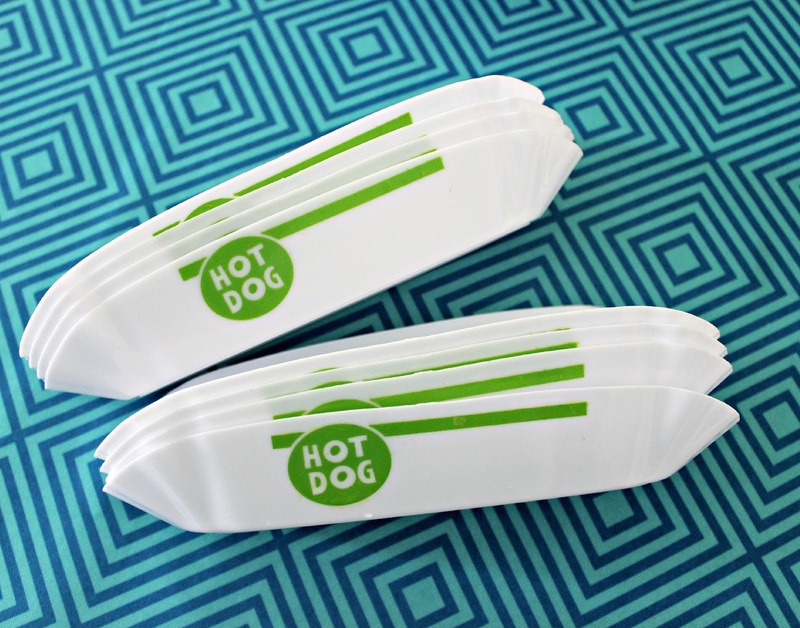 Do you know how excited I was when I stumbled upon these adorable-perfectly-appropriately-party-color-hot dog holders?! I practically did the running man right there in the middle of the store aisle. 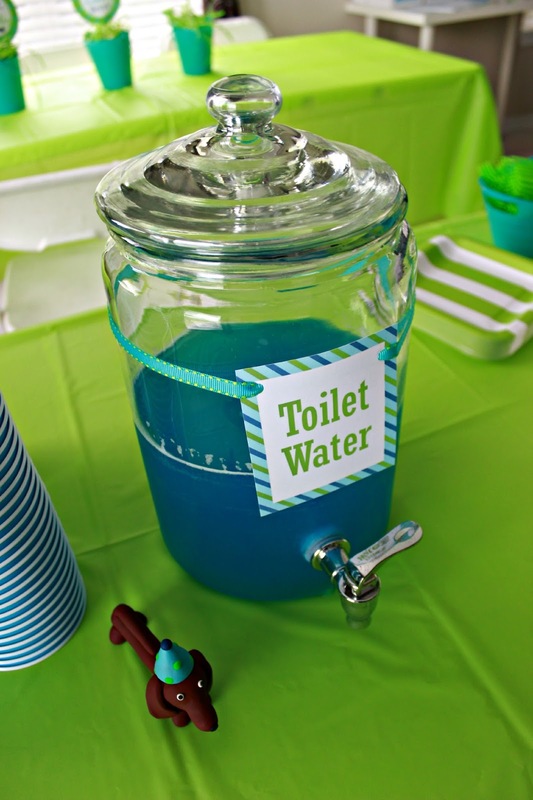 And since my guests only deserve the best , we had them wash down their food with some "toilet water". 50/50 Hawaiian Blue Punch and Sprite. It was a hit with the kiddos! 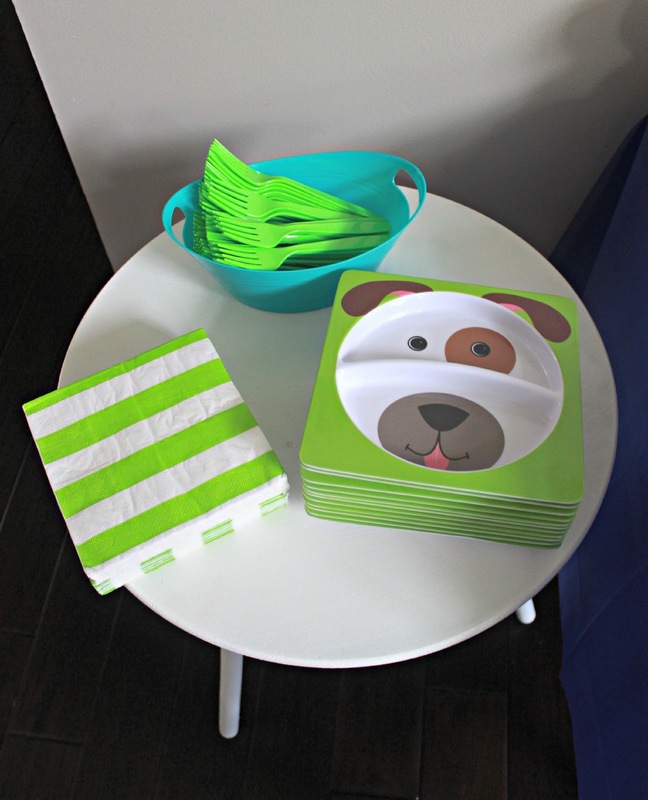 The kids also got to eat off of these cute doggie plates I found at the Dollar Store. Double bonus was they served as favors too! Phew....so that's a wrap for PART 1 folks! I still have some more fun "pawty" stuff to share so make sure to drop by again soon. In other news, last we spoke here on the blog I had mentioned that we had put our house on the market? Well, in case you don't follow DN on Instagram or Facebook we sold it! AND we're already in our new home! That's right the buyers gave us 3 weeks before they kicked us to the curb. So that along with throwing this party seven days before the move explains my absence. My life is still cuckoo crazy so it will be awhile before I am back blogging on a regular basis and the shop will remain closed until further notice. If I forgot anything let me know! Edited: Check out Part 2 here ! Su'paw! Way to raise the 'woof'! 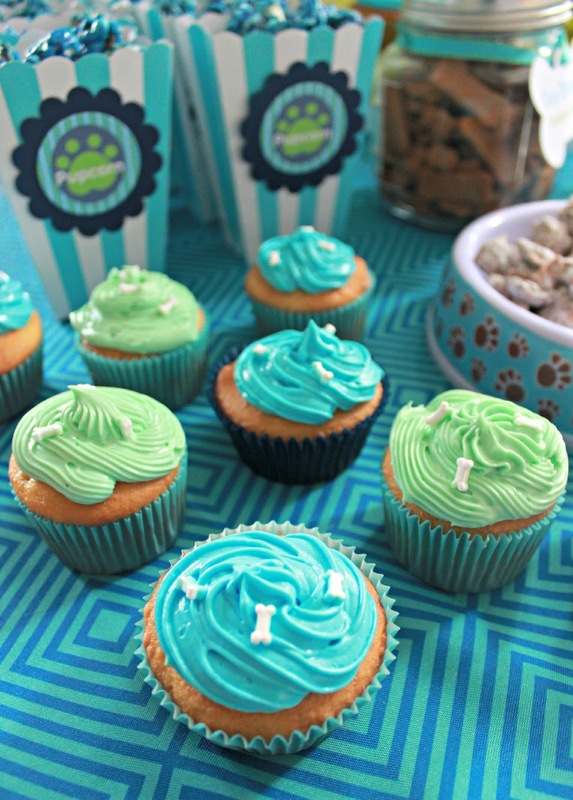 Such a 'pup'tastic party! I love all the details and the puns!! 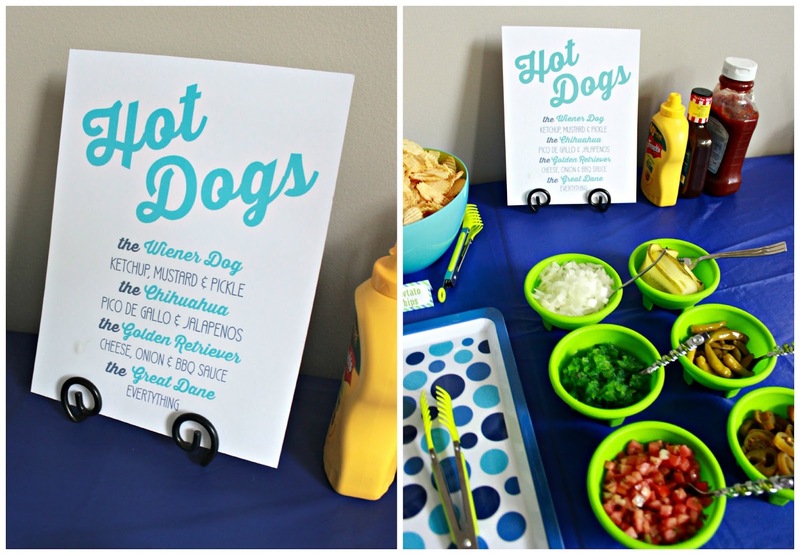 Your hotdog menu was awesome and the décor-- amazing! What a great party, I can't wait to see more! I love it all...especially the toilet water..lol. Love that you used the Boon Lawn drying piece too. Genius!! What a lucky boy! This is freaking adorable!! 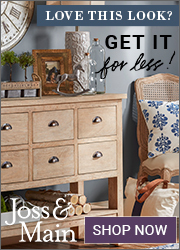 You did not skimp on any details. What a good momma you are! I don't know HOW I missed this! Love all the details, you missed nothing! Seriously, the CUTEST ever! You did a super pup'tastic party, I'm in awe! Pinned! 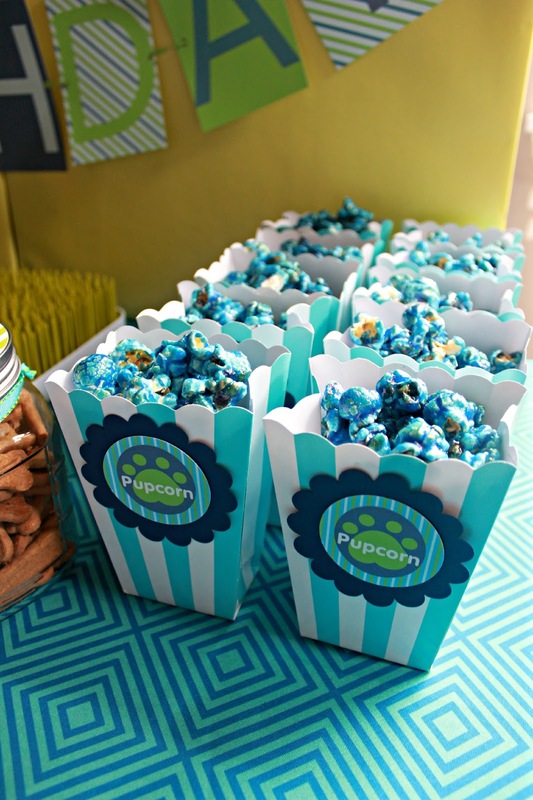 I love the puppy chow and pupcorn! So clever! Pinning onto my kids birthday party idea board! This is really adorable! I love all the details. The little bone sprinkles on the cupcakes are so cute. Oh my goodness! I am due with a baby boy in January but have been casually browsing baby boy 1st birthday ideas just to see what's out there since we have a girl now and that's all I know...I have hated everything I have seen but I ADORE this theme! HOW CUTE!!!!! Cutest little puppy party ever!! Never thought about a party theme like this. Love it! Where did you get the white bone-shaped picture frame? 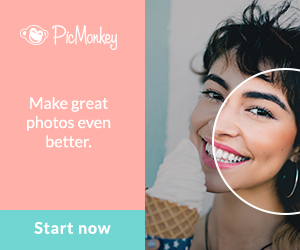 It'd be great to have!